Pakistan: walking the tight rope? Charles M. Schulz was a great cartoonist. His world-acclaimed cartoon series of 'Peanuts' still remains popular being reprinted again and again. "How can I play baseball when I'm worried about foreign policy?" he asks (The Complete Peanuts, Vol. 6: 1961-1962). Indeed, foreign policy of any country has to be a balancing of many acts, juggling various interests with different desired objectives, many a time at odds with each other. With Pakistan it's more of walking on a tight rope. The changing geo-political scenario demands a serious formation of a well-thought-out foreign policy. On the eve of United States forces' exit from next-door Afghanistan, Pakistan needs some clear-headed thinking to determine its course of relationships in particular with its neighbouring countries. The recent visit of Iranian Interior Minister Abdolreza Rahmani Fazli to Pakistan and PM Nawaz's subsequent visit to Iran must be seen in the backdrop of its growing cozy relationship with Saudi Arabia. The latter has recently loaned $1.5 billion to Pakistan "to help Islamabad shore up its foreign-exchange reserves, meet debt-service obligations and undertake large energy and infrastructure projects" (Reuters Mar 13, 2014). This was not all. On February 18, 2014, Pakistan and Saudi Arabia signed a $183 million credit agreement. One dealt with the construction of a hydro-power project in Chitral, while the other with the import of urea fertiliser from Saudi Arabia. These overtures are being eyed with great unease by predominantly Shi'a Iran. Particularly as Pakistan decided to support Saudi Arabia in its demand to replace Bashar al Assad's regime with an interim government in Syria on the same date as the signing of the agreement. Their immediate reaction to signing of the credit agreement was that on the very same date Iran issued a threat to Pakistan to send forces within its borders should it fail to rescue the five Iranian border guards abducted 10 days prior to these developments. Although it is claimed by a local newspaper that they were kidnapped from Iran's Sistan-Baluchestan province, adjoining Pakistan. Iran has increased the numbers of security heads at this border already. According to a report by a local newspaper, "Iran's police chief has hinted that his country would seal its border with Pakistan any time. "It is very important to ensure security on the eastern border" (May 5, 2014). There are a number of thorny issues that will come under consideration during the Prime Minister's visit to Iran. The gas pipeline between Iran and Pakistan is one. In my op-ed published December 24, 2013, I had written, "There could have been many reasons for Pakistan playing coy on the project; or maybe a mix of reasons. First, Pakistan may have dilly dallied owing to the rates at which it would have had to import the gas from Iran even after the project was completed. The rates would have been high. Much higher than the ability of the average domestic consumer to afford. According to a report by a local newspaper, "Iran itself imports gas from Turkmenistan at USD 4/MMBtu while the price at which it would export to Pakistan is an exorbitant figure of USD 14/MMBtu" (published 2013-11-09). Added to this is the fact that Iran herself imports gas; seasonal increases in the demand in winter makes it difficult for Iran to supply gas to Turkey as per their needs. "On October 1, Iranian Oil Minister Bijan Namdar Zanganeh himself raised concern about Iran facing serious gas shortage because of slow progress in raising levels of production from South Pars -- the field that is supposed to fill the IP pipeline. If such factors were seriously taken into account, the pipeline agreement would likely have never been signed at the first place" (published 2013-11-09). Though Iran and Pakistan have agreed to move ahead on this project during Nawaz Sharif's visit to Iran, offering words to implement the project without taking any steps to do so indefinitely may well raise temperatures. How does Pakistan deflect imposition of economic sanctions by the western countries particularly US if it decides to go ahead is anybody's guess? Iran has increased the numbers of security heads at this border already. According to a report by a local newspaper, Iran's police chief has hinted that his country would seal its border with Pakistan any time. Another issue of burning importance to Iran will be Syria. In my op-ed dated September 03, 2013, titled, "Syria and the 'Greater Iran'" I wrote, "There are the religious-geographic dynamics that cannot be overlooked. Hezbollah and Iran in hands with Alawites of Syria have been aiming at reviving the Greater Iran, keeping in view their own schismatic ideology, the effects of which reflect in the current proxy war in Pakistan. The geographic link formed is Hezbollah on one end, Syria and Iraq forming the center with Iran at the other end converging to solidify a unified religious school of thought. Is the Middle East or South Asia ready for the revival of a Greater Iran?" Pakistan has to walk a tight rope between Iran and Saudi Arabia, the former predominantly Shi'a and the latter predominantly Sunni. Coming back to Afghanistan; Hamid Karzai paid a visit to Iran in December 2013. The visit bore fruit. Both countries signed a "pact of friendship and cooperation". This agreement between the countries was not a first in recent times. In 2013 both had earlier entered into a security agreement. In yet another of my pieces I wrote, "According to a report 70 per cent of media in the country today is controlled by Iran. Another report by Reuters says Iran spends $100 million a year in Afghanistan, much of it on media, civil-society projects, and religious schools; quoting Daud Moradian, a former foreign ministry advisor, who now teaches at the American University in Kabul (published May 24, 2012). The impact of propaganda and one-sided "truth" are immense; Iran had supported non-Taliban groups in 1990s and may revert to doing so yet again. To accept a predominantly Sunni regime in the face of Taliban in power may result in a proxy war, supporting the Afghanistan's Hazara populace that is mostly Shi'a. Iran's pursuance of its schismatic policy in Afghanistan will continue to provoke divisions along the fault lines in Afghan society" (published October 08, 2013). Iran is not the only country interested in developing friendlier relations with Afghanistan. India too has invested heavily in Afghanistan. "India has donated or helped to build electrical-power plants, health facilities for children and amputees, 400 buses and 200 minibuses, and a fleet of aircraft for Ariana Afghan Airlines. India has also been involved in constructing power lines, digging wells, running sanitation projects, and using solar energy to light up villages, while Indian telecommunications personnel have built digitised telecommunications networks in 11 provinces. One thousand Afghan students a year have been offered scholarships to Indian universities. India has also played a key role in the construction of a new Afghan parliament in Kabul at a cost of $25 million" (William Dalrymple: a Brookings Essay titled; A Deadly Triangle: Afghanistan, Pakistan & India). India has also invested heavily in the Ayni Air Base also known as the 'Gissar Air Base' placed 10km west of the capital of Tajikistan-Dushanbe. Not only this; India also has a foothold on the Farkhor Air Base, a military air base. This strategic base is located near the town of Farkhor in Tajikistan. This is roughly 130 kilometers south east of the capital Dushanbe. Aircraft that take off from Farkhor need literally minutes to be in Pakistan air space. I had written earlier, "These combined steps places India in a strong position for the 'new' great game that is emerging with a changed political landscape in Afghanistan. Islamabad fears; and for good reason that an India and Tajikistan nexus will lead to an infiltration via Afghanistan, using an unprotected western flank that will 'encircle' Pakistan, cutting off oxygen. What Pakistan must do; is to redraw its foreign policy." In this scenario, Pakistan needs to marry together short- and long-term, balanced and well-thought-out foreign policy. Pakistan must rise to the occasion. The writer is a lawyer, academic and political analyst. 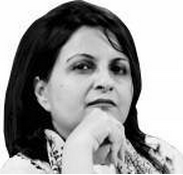 She has authored a book titled 'A Comparative Analysis of Media & Media Laws in Pakistan.' She is also Member of the Task Force constituted by the Standing Committee of National Assembly of Pakistan to review and recommend changes in the media laws of Pakistan. She tweets at @yasmeen_9.